Welcome to our YouTube Video! Danger High Voltage. Will shock, burn or cause death. For any non-audio applications, customers are suggested to send an inquiry e-mail to us for system compatibility confirmation. Sure Electronics does not take any responsibilities for any abused and unconfirmed non-audio system integration. 1.Sure Electronics reserves the right to wipe off the characters, logos and patterns on the surface of the chips without any notification. Any inquiries about the models of the chips will be ignored. Sure Electronics will guarantee all the chips are original ones and the performance and quality will not be affected by such operations. responsibility for any personal injury or property damage. 3.Sure Electronics only takes responsibility for the loss caused by the audio amplifier board itself. We are not responsible for any joint liability. 4. Only when the input voltage reaches the rated voltage will the output power reaches the nominal value. Sure Electronics build this product series for high quality sound. IBK series is driven by Class-T (a branch from Tripath Class-D) modulator, and provide very warm and powerful sound. For DBK series, we fine select very low RDSon MOSFETs and they must be audio suitable in our test, extremmely fast recovery diodes, in our discrete power stage. 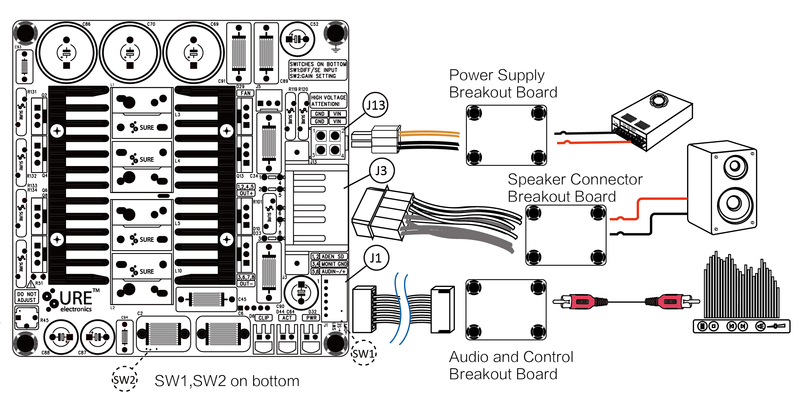 That makes our audio amplifer boards can provide best high sound quality for listening, not only in datasheet. The robustness and reliability of the Brick series makes them a great match for professional and industrial applications. The excellent sound quality makes them suitable for final customer audio applications. It is also easy for system integration with following functions: Choose a Brick amplifier module for product develpoment will save huge maintenance costs and me. Plug-in joints on board offer a more easier way for installation. 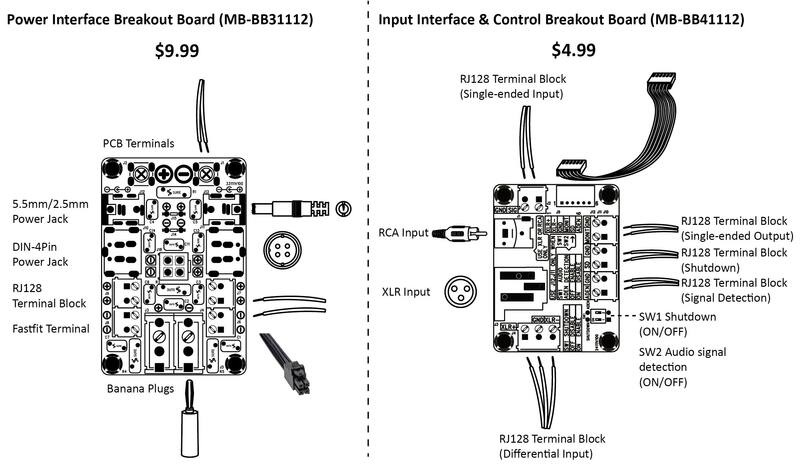 Sure Electronics interface breakout boards also provide a consumer audio solution. 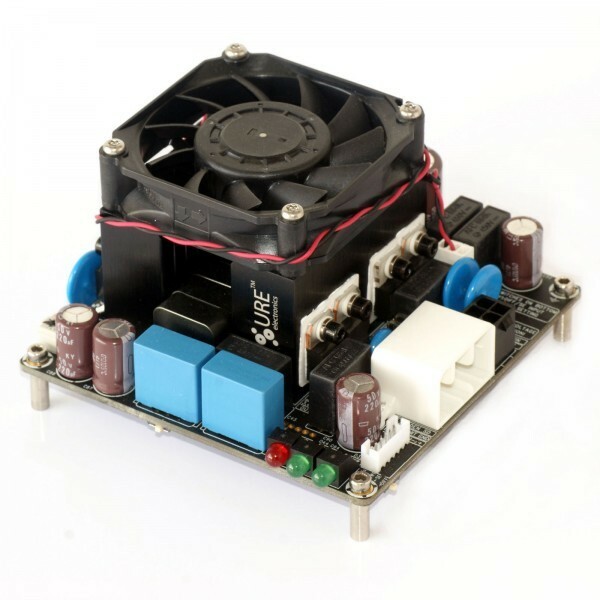 By means of dedicated heatsink design with temperature controlled fan, these boards are capable of delivering maximum power simultaneously. Besides of built-in chip protection, ESD and spike protection components used throughout input and output of the amplifier board ensure its robustness and reliability. This product series requires single supply ONLY. You don't have to use transformers, only one switching power supply unit is enough and we even do not need any auxiliary power supply. That will greatly reduce the installation me and the system design is never complex. Sure Electronics also provide a Farad Capacitor solution, which can ensure customer use 350WaDs - 600WaDs Power Supply Unit to drive 1kW rated audio load. Contact us for details if you are designer for subwoofers, it will reduce your cost greatly, not by using a fake power marking trick. You don't have to save up hundreds of dollars to get them. They start with only $64.9, and end with $199. For those customers who design subwoofers, or need high power amplfier solutions, please feel free to contact our worldwide distributors, or contact Sure Electronics directly, we are the specialist in HIGH POWER audio amplifiers. Tell us your budget, and get a solution here. The Brick sereis provides a very sensitive auto signal detection functionality which detects the main input audio signal and switches to corresponding channel automatically. Along with standby functionality, Brick series provide a more convenient way to control your system, save your engineering cost and improve operating experience. The standby current consumption is only several mA, or typically less than 100mW, that will keep a very high headroom for your Energy Star or CE certification. 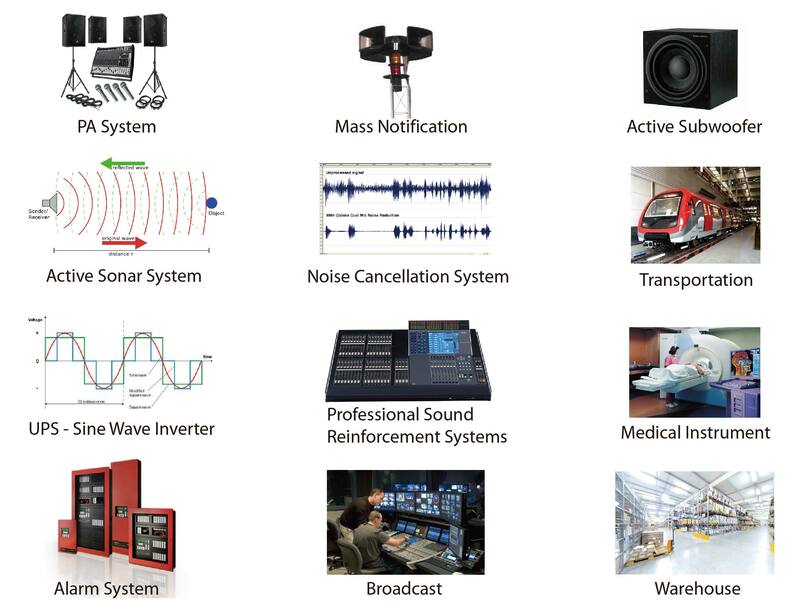 To provide a very high sound quality, we use a high carrier frequency in mute or play state, but we still provide a low power consumption and high efficiency, take reference from the datasheet. During the practical industrial amplifier installation, high up to several tens of minutes will be spent on connection and debugging in last step of assembly and test. The reasons behind potential problems lie on many aspects of operation, such as power pins reverse polarity, the correct mul-channel orders, volume adjustment of each channel, signal channel disconnection caused by the poor contact and so on. In order to solve the problems mentioned above and improve the effective connection and pass rate of test, we take the advantage of different forms of connectors for power connections, speaker connections, signal input connections and potentiometer connections. For example, 4CKTS Molex SL vercal header, 6CKTS JST PH SMT top entry type header and 8CKTS Mul-Lock header are populated in Brick series amplifier boards for easy recognizations. Furthermore, we also provide the matched extension cables for different connectors, which are easily made disntiguished from each other by different cable colors. 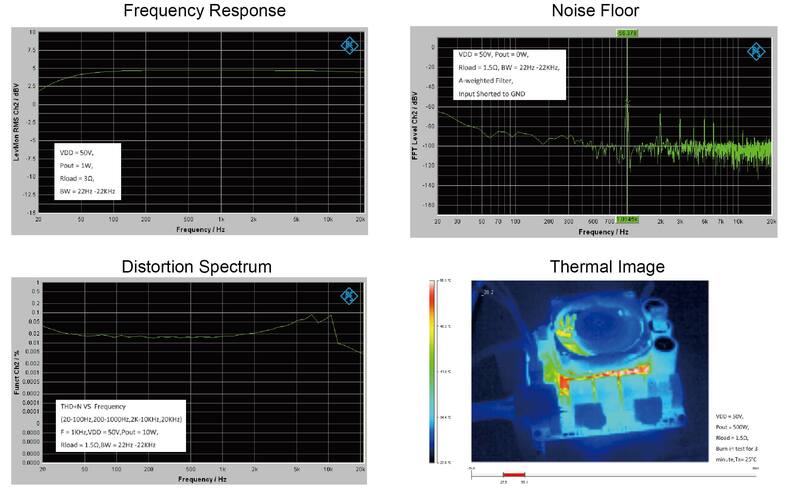 We spare no effects in improving the connection and measurement efficiency and saving the cost on installations and debugging. All parameters were tested with Rohde & Schwarz UPV audio analyzer (AES17 filter enabled) and Audio Precision AUX0025 filter.